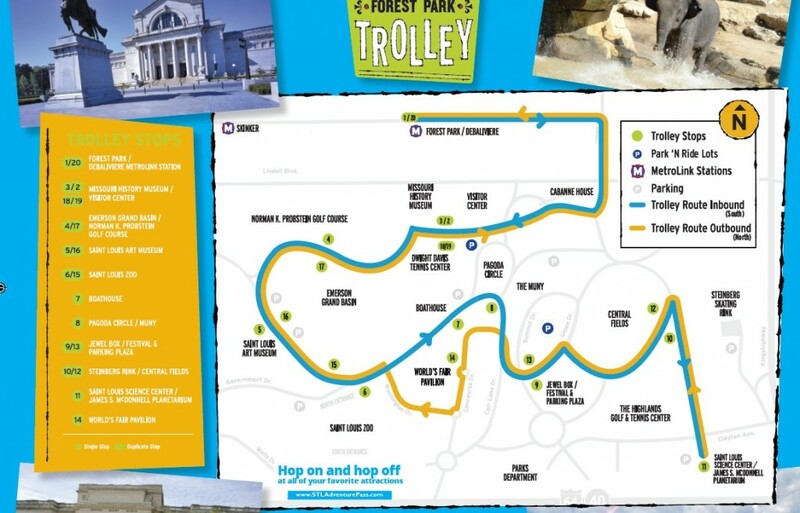 The Metro Forest Park Trolley will officially return to Forest Park for the fifth season Friday, May 1, giving individuals visiting Forest Park a convenient method of navigating the Park, in addition to assisting to alleviate Park congestion. The Metro Forest Park Trolley Service (MetroBus route #3) will operate daily between 9 a.m. and 7 p.m. from May 1 through September 27, and will connect with all of the popular Park attractions, as well as the Forest Park-DeBaliviere MetroLink Station. The Metro #3 Forest Park Trolley will also provide service to select destinations (map below) within the Park between 6:30 a.m. and 8:30 a.m.
Trolley tickets are $2 for adults, $1 for children (ages 5-12), seniors and disabled passengers, and the Trolley is free for children ages 4 and under. A valid Metro Reduced Fare permit is required for the Senior and Disabled discount. Two convenient Park N’ Ride options are available for visitors: the Twin Parking Lots across from the Dennis & Judith Jones Visitor and Education Center and the Festival & Parking Plaza at the Upper Muny. From these lots, visitors can hop aboard the Forest Park Trolley for a lift to their desired attraction. 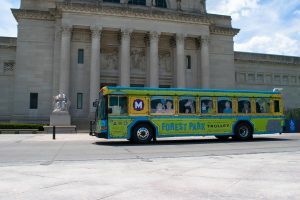 The Metro #3 Forest Park Trolley is a partnership between Forest Park Forever, Bi-State Development Agency/Metro, Missouri History Museum, Saint Louis Art Museum, Saint Louis Science Center, Saint Louis Zoo and the City of St. Louis. Daily service between 9 a.m. and 7 p.m., May 1 through September 27. From Monday through Friday, the trolley operates every 20 minutes between 9:30 a.m. and 4:30 p.m., and every 30 minutes before 9:30 a.m. and after 4:30 p.m. On Saturday and Sunday, the trolley operates every 15 minutes between 9:30 a.m. and 4:30 p.m., and every 30 minutes before 9:30 a.m. and after 4:30 p.m.
Limited early service between 6:30 a.m. and 8:30 a.m., May 1 through September 27. The trolley will provide service every 30 minutes to select destinations within Forest Park, including the Dennis & Judith Jones Visitor and Education Center, Missouri History Museum, Saint Louis Art Museum and Saint Louis Zoo. Passengers can get to and from various St. Louis attractions by purchasing the Metro Adventure Pass. The unlimited single-day pass allows you access to all St. Louis has to offer via the Forest Park Trolley, Downtown Trolley, MetroBus and MetroLink for only $7.50. One-Day Trolley tickets can be purchased onboard the Trolley (exact change required), at Perk Café inside the Dennis & Judith Jones Visitor and Education Center, and at the Planetarium Ticket Station at the Saint Louis Science Center. Each Trolley ticket allows unlimited on & off privileges for the day the fare is purchased. Valid Metro passes are acceptable fares for the Forest Park Trolley. 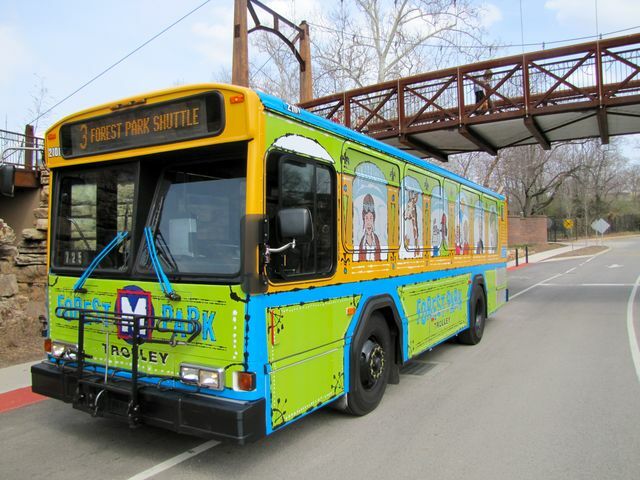 Visitors who are combining MetroLink or MetroBus with the Forest Park Trolley should consider purchasing the Metro Adventure Pass. Available at Metro Ticket Vending Machines located at all MetroLink stations, the Metro Adventure Pass provides unlimited single-day rides on MetroLink, MetroBus, the Forest Park Trolley and Downtown Trolley, and lets visitors easily explore Forest Park and other attractions throughout the region. Forest Park Trolley tickets and the Metro Adventure Pass can also be purchased at the MetroStore, located at 7th and Washington in downtown St. Louis. The MetroStore is open Monday through Friday from 8:30 a.m. to 5 p.m.
Due to construction from the Loop Trolley Project, passengers at the Forest Park-DeBaliviere MetroLink Station will need to board the #3 Forest Park Trolley at the corner of Pershing and DeBaliviere Avenues, just north of the station. Trolley Head Signs – #3 Forest Park Trolley vehicles coming from the Forest Park-DeBaliviere MetroLink station are identified as Southbound – To Science Center. Forest Park Trolley vehicles heading toward the Forest Park-DeBaliviere Station are identified as Northbound – To Forest Park MetroLink Station. The #3 Forest Park Trolley is fully accessible to persons with disabilities. For riders coming from Delmar, the Trolley stops just outside the DeBaliviere garage (both directions) have always been convenient. However, recently, it seems that some drivers are not recognizing these stops and forcing passengers to get off at Pershing and DeBaliviere or further away. This is an inconvenience that does not appear to serve any purpose. Please ensure that the Forest Park Trolley stops at or outside the DeBaliviere garage at the designated stop locations (within the Metro property for buses going towards the park & on DeBaliviere Ave before the buses turn back into the garage). Will the #3 Forest Park Trolley run during Fair St. Louis on 4th of July weekend? The Forest Park Trolley will not be in service July 2 – July 4.